Three years ago, Harshad locked himself in the King Cobra enclosure where the deadly snakes ignored him much to the relief of the authorities, during a protest for not making his job permanent. Thiruvananthapuram: A.S. Harshad, the 41-year old lone reptile keeper at the city Zoo has been working on daily wages since the last 15 years. In a Facebook post, Harshad laments about how he is being harassed by his junior colleagues who succeeded in getting a stay order from the court to prevent his permanent appointment. Three years ago, Harshad had landed in a soup when he locked himself in the King Cobra enclosure where the deadly snakes ignored him much to the relief of the authorities, during a protest for not making his job permanent. Kattakada native Harshad grew amidst snakes and animals as his family was running a street circus troupe across the state for several decades. The Wildlife Protection Act of 1972, which has been implemented strictly since the mid 90’s sounded the death knell for Harshad’s family business. His association with animals and snakes led him to apply for a keeper job at the city zoo in 2002. After two years, the then zoo authorities entrusted him to take care of the deadly reptiles which he has dutifully been discharging, including taking care of the seven green anacondas. He experssed his frustration in a Facebook post. “My junior colleagues who have less than 10 years experience had not found their names included in the list received by the Employment Directorate. Unfortunately, they approached the court and received a stay order so that I am unsuccessful in getting a permanent placement. I neither have the political clout nor the money to hire a lawyer,” he said in his Facebook post which he has since deleted as per request from authorities. 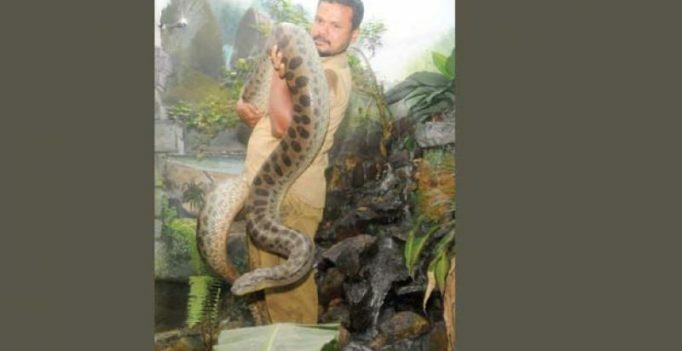 A top zoo official told this newspaper that if it were not for Harshad’s service, the deadly reptiles would not have been cared for which explains his dedication. There are days when Harshad would work for close to 12 hours a day and sometimes more. K. Gangadharan, museum and zoo director told this newspaper that despite the department giving all documents before the court stating that Harshad has got the requisite qualifications of Class VII pass plus two years of caring for wild animals, his juniors played spoilsport. “Every month, the unlucky keepers who have no chance of getting into the job list get the stay extended at the court. We sincerely want Harshad to get the reptile keeper post permanent and are hoping that the government will take an initiative,” said Mr Gangadharan. He also informed that there are 16 vacancies of Zoo keepers which they are unable to be filled due to the handiwork of a section of the keepers who are misusing the judiciary.